Happy Halloween from the entire Anime Corner crew! The folks at Sentai confirmed earlier this week that they have licensed the Eroge Anime Mashiro-Iro Symphony: The color of lovers. They plan to release the series subtitled on DVD later in 2012. The anime premiered in Japan on October 4, and that evil greedy streaming company is currently simulcasting the series in North America. Mashiro-Iro Symphony: The traditional girls-only Yuihime Private Academy is considering the possibility of starting to accept both genders and has thus made an agreement with a neighboring school to receive some of its students as an experiment to see the reaction to this adaptation. Shingo Iryu is one of the many students transferred for a ten month experimental phase at Yuihime Academy. He, his sister, and his fellow relocated colleagues are impressed by the sophisticated campus, but even more by the resistance of many students who don't want the boys over there. Here's one I've been meaning to post on for a few days now. The Funimation folks announced at their New York Comic Con panel that they have licensed the Fafner TV series and film (Sokyu no Fafner: Dead Aggressor: Heaven and Earth), and also the Oblivion Island: Haruka and the Magic Mirror Anime movie. The Fafner series is old news and was originally published by Geneon in 2005. Geneon went under in 2008, but the old Fafner DVD's have pretty much remained. Ditan had tens of thousands of unsold copies left in their warehouse when Geneon bit it, so the series hasn't ever really been scarce, even after all this time. The film, on the other hand, only came out a year ago and a US release is most welcome. It's quite good. The Oblivion Island film came out in Japan a couple years ago and is 100% 3D CGI. It won a bunch of awards, and is really excellent. It comes HIGHLY recommended by me, which as you know, I hardly ever do. It's just too bad Funi still has A HUGE lag time between announce and publish, and probably won't get it out on the street until around this time next year. Fafner TV Series: Tatsumiyajima is the central island in the middle of a small cluster of islands, in a sleepy backwater of the Japanese isles. Not much happens there, and the island's young people go to school knowing that their lives are likely to remain peaceful and undisturbed. Or so they have been taught... but the truth is different. The fate of mankind is on the line, and Tatsumiyajima is the last line of defense against a hostile and incomprehensible enemy. At the center of it all, fighting for Humanity's continued existence, is the giant robot Fafner, the dragon that guards this final treasure of mankind. Sokyu no Fafner: Dead Aggressor, Heaven and Earth: Two years after the end of the original Soukyuu no Fafner TV series, Tatsumiya Island and its surviving residents have returned to some semblance of recovery. However, things have become desperate for our hero, Kazuki; nearly blind now, and partially crippled from his battles with the Festum two years earlier, he clings to the promise his fallen friend Soushi made to him to return to the island and set things right again. Kazuki's hopes flare when a lifeform is detected within an unmanned submarine that comes floating into Tatsumiya Bay one night, but the person aboard isn't Soushi; it is a mysterious "boy" named Misao Kurusu who may not be entirely human, and who claims to have been sent by Soushi. With Misao's arrival, hostilities break out anew between the Human Army and the Festum, and the Fafner pilots are thrown into the most desperate battle of their lives--this time, with the fate of TWO races riding on their shoulders. Oblivion Island: Haruka and the Magic Mirror Film: Haruka is a single daughter who lost her mother at a young age because of terminal illness. She continued to live with her father after that but time and the fact that her father is always busy with his work has created an emotional distance between them. When her mother was still alive, she received a hand mirror from her as a present and she treasured it a lot. After her mother's death, she started to forget about the mirror until she eventually lost it. One day, she decides to go to a local shrine and pray for the return of her lost mirror. It is there that she accidentally encounters a small masked creature which she secretly follows to the land of forgotten items. Section 23 January 2012 Releases - Now Available for Pre-Order! My thoughts? Once again Section 23 comes through with a fantastic list of nearly all new material. They are even giving us a dubbed version of Princess Resurrection, and no messy re-releases to deal with. I swear if it wasn't for them, we'd hardly have any new Anime releases in the pipeline at all. While the other studios are sitting around wringing their hands about digital this and live action that trying to figure out which direction to go in, Section 23 is getting it done for the rest of us. Kudos! I just received my package and I must say that I am totally, completely, utterly, satisfied! I was actually very surprised to see my stuff so neatly wrapped in bubblewrap. It made me feel like my items were given a personal touch. I'm not a frequent shopper here, but after my recent experience, I was reminded that I need to shop here more often! You guys even had a manga that my usual retailer sold out of! I especially like the 'creepy weird guy that hangs around your booth for 8 hours'. Anyone who's ever worked the dealer room at an Anime con knows that one is right on target! "Dude, get outta here already, isn't there a screening room or workshop you should be sitting in??!!" Funimation's January Releases - Now Available for Pre-Order! Funimation has sent us over their January 2012 sales book, and we now have it up on the store site for pre-order. Being in any sort of retail is probably one of the most thankless jobs that exists. This is especially true online, where (for example) people that you have never met can lay the blame that they waited to long to use the last coupon squarely at your own mothers door and in the most colorful language without the slightest fear you will come over the counter and introduce their face to your fist. As I sat in my room pondering what should be my next anime purchase; RACS popped into my mind. I then remembered how before I discovered RACS I only knew of the anime that came on Toonami (just made myself feel so old), Adult Swim, and 4Kids. My first anime purchase that did not come from any of those networks was Princess TuTu and Galaxy Railways, that I purchased from RACS. Ever since I discovered this wonderful store I feel as if my anime world expanded. At the end of the week I always make sure to read the newsletter, the newsletter helps me with decisions of purchasing certain items, and so far it hasn't lead me astray. The BEST thing I love about RACS is that the staff there is so wonderful, and I truly appreciate all the hard work the staff of RACS does for everyone. Sentai has announced that they have licensed the six-part anime film series Broken Blade (Break Blade). The series is based on Yunosuke Yoshinaga's alternate-world robot manga, the first 3 volumes of whic were published by CMX Manga before they shut down last year. Sentai plans to release the series on DVD and BD in 2012. Synopsis: The inhabitants of the continent of Cruzon are born with the ability to freely control quartz. Technology based on this power allows them to perform a great multitude of tasks such as shoot projectiles and pilot mobile suits (called Golems in this society). Rygart Arrow is an un-sorcerer, a rare individual who is unable to levitate even the smallest crystal. Living with his brother on a farm, he receives a letter from an old friend, Hodr, the current king. Close companion of the king and queen when they were students at Assam Military School, Arrow is informed that a war is about to occur. Hodr called him because an ancient type of Golem has been found in a mining shaft. No one has been able to move it and Queen Sigyn, an expert engineer, suspects that maybe an un-sorcerer might be the key to activate it. Funimation has announced a short delay in the release of the upcoming Yu Yu Hakusho OVA (Eizou Hakusho) DVD Set. It's been pushed back 2 weeks from Nov 29th to Dec 13th. As I'm sure you already know, Steve Jobs passed away yesterday. Jobs was probably one of the most brilliant creators and marketers of products in history. He also was born into and worked in a country, and at a time, that allowed him and his inventions to flourish, making himself rich in the process. Thinking about it, I sit here and wonder if Steve Jobs could start 'Apple' in his garage today and still get it off the ground floor. With all the misplaced anger we see today directed at successful people, all the talk of corporate greed, and all the finger pointing by people blaming someone else for their lot in life, it makes me wonder if Steve Jobs will be the last true capitalist that political correctness will permit us to admire? But really, who cares what's "permitted?". For myself, Steve Jobs was an inspirational figure, and I for one plan to keep on misbehaving - just like he did. Sentai announced at its Anime Weekend Atlanta panel that it has licensed four new series: Towa no Quon film, The World God Only Knows (Season 1), Akikan! , and And yet The Town Moves. The 6-part film series Towa no Quon follows the story of a boy named Quon who wakes up with supernatural powers. He must protect himself and those like him from Kestos, the secret organization hunting them. In the World God Only Knows (Kami Nomi zo Shiru Sekai) Keima Katsuragi is a high school boy who is known as the "Capturing God" for his success at romance simulation games. However, thanks to a contract with a devil, he now has to capture the hearts of real girls to catch the runaway spirits hidden in those hearts. The 12 ep series Akikan! revolves around a typical high school boy named Kakeru Daichi and the can of melon juice soda that he bought from a vending machine. The can suddenly transforms into a beautiful but standoffish girl that Kakeru nicknames "Melon," and more "Akikan!" 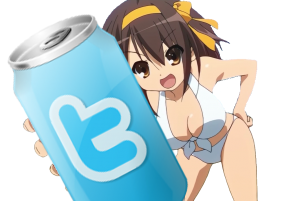 ("empty can") girls appear. However, Akikan girls need to be (of course) infused with carbon dioxide from kissing to survive. The comedy series And yet The Town Moves is an adaptation of the Soredemo Machi wa Mawatteiru manga series. The story centers around Seaside, a slightly odd maid tea shop (kissa) in an otherwise ordinary shopping district of a mundane neighborhood in Tokyo. Hotori works at Seaside and daydreams about being a high school girl detective. Funimation announced over the weekend at their Anime Weekend Atlanta panel that they have picked up both the .Hack//Quantum OVA and Guilty Crown anime shows. Funi plans to release the .Hack//Quantum OVA on DVD in early 2012. Guilty Crown will be streamed for now, and FUni did not say when they might be releasing the title on home video. .hack//Quantum OVA is set in The World R:X setting of last year's .hack//Link game for the Sony PSP. In the story, the player characters Tobias, Mary, and Sakuya form a party in The World R:X for adventure but encounter a mysterious entity named Hermit. The encounter draws them into the all-consuming darkness taking over The World R:X. Guilty Crown is set in Japan in 2039, 10 years after the "Apocalypse Virus" devastated the land in an incident known as "Lost Christmas." A multinational organization known as GHQ brings the lawless country under control, but at the price of Japan's sovereignty. One day, an unsociable 17-year-old second-year high school student named Shū Ouma encounters Inori Yuzuriha, a female singer who is part of the resistance to liberate Japan. Together with Gai Tsutsugami (Shu's 17-year-old rival who is a young "Jiikundo" pilot in the resistance), Shu and Inori fight with mysterious innate abilities known as "imperial powers."